These new, low-cost sensors offer additional features and benefits that reduce material and labor costs. The industry-proven ELF family has been updated to its second generation. These updates include minor modernizations to the sensors� housings, along with enhancements to performance, enclosure rating, and sensing ranges. 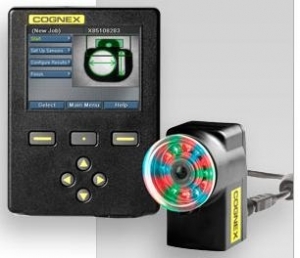 The Z Sensor has a clear housing that enables 360� of visible indication of the sensor�s status LEDs. The ELF and Z are both assembled in the United States, which allows SICK to customize the sensors (cable cut to length, addition of different connectors, brackets, customer-specific cable label, bulk pack, kit with reflector/bracket, etc. ), reducing material and labor costs, and providing greater flexibility. MIDDLETOWN, Pa. - The new CONTACTRON 4-in-1 solid state reversing contactor from Phoenix Contact combines four functions in one narrow package. Designed for three-phase AC motors up to 4 kW/5 HP in size, the 4-in-1 provides forward, reverse, overload protection and redundant emergency stop contactor functionality in a 22.5 mm-wide module. 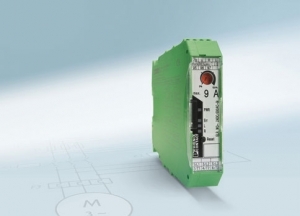 The compact size reduces the necessary DIN rail space by up to 75 percent, saving space and wiring costs as compared to a contactor-based solution. The CONTACTRON's life expectancy is up to 10 times longer than traditional electromechanical contactors, which results in reduced maintenance costs. Integrated input/output surge protection circuits reduce system downtime, and 16 separate motor overload settings reduce inventory requirements. LED and remote indication acknowledge motor status. The CONTACTRON 4-in-1 is rated for safety category 3, SIL 3 and ATEX zone 2. 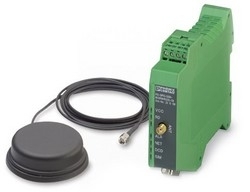 The GSM/GPRS serial modem from Phoenix Contact provides global access to machines and systems via GSM connections. An integrated TCP/IP stack allows the implementation of simple control systems into the GPRS network. The PSI-GPRS/GSM-MODEM/RS232-QB-USA modem has the necessary PTCRB and AT&T approvals for legal use to GSM and GPRS networks within the U.S. and Canada. Once activated, the modem will work anywhere in North America where AT&T or Rogers Wireless cellular networks provide service coverage. A pre-installed SIM card makes activation quick and easy. Phoenix Contact\\\'s service partner, Stanza Systems, offers Diversenet service, eliminating the need to contact another carrier. Diversenet can be used to monitor both remote and metropolitan equipment as well as to send notifications and alarms via SMS, right to a cell phone. Siemens Energy & Automation, Inc. has added new space saving and low cost analog and temperature expansion I/O modules to its SIMATIC� S7-200 micro PLC product line. The high density, four- and eight-channel modules offer twice the number of channels per module in the same standard expansion module case size. The EM231 series eight-channel analog input module supports industry standard unipolar 0-10VDC, 0-5VDC, 0-20mA and bi-polar +/- 5VDC, +/-2.5VDC input signals. The EM232 series four-channel analog output module supports both 0-10VDC and 0-20mA output signals. The EM231 TC eight-channel thermocouple temperature input module supports seven different thermocouple sensor types and +/-80mv input signals, enabling it to perform in the variety of temperature control applications. The EM231 RTD new four-channel RTD temperature input module supports eight different RTD sensor types and 150-ohm, 300-ohm, and 600-ohm resistance inputs. Axis is hosting a Siemens Open House so that customers can come in and see the Siemens Productivity Tour: a simulated soccer ball manufacturing line consisting of seven demonstration units, spanning over 28 feet long! The simulated factory demonstrates how the concept of “Totally Integrated Automation” maximizes productivity and safety, while reducing costs. We will show the technology drivers behind Siemens integrated safety and wireless safety, Ethernet communications (via Profinet wireless network) and remote I/O, embedded automation, motion control and drives, SCADA, HMI panels featuring Smart Access, and integrated diagnostics to reduce downtime. All to make your process / plant more productive. Siemens and Axis, Inc. technical resources will be on hand to guide and help you through differentiating technologies, and to consult on ways to improve and benefit your current automation architectures.